Considering the purchase of a Height Adjustable Reclining High Back Chair? 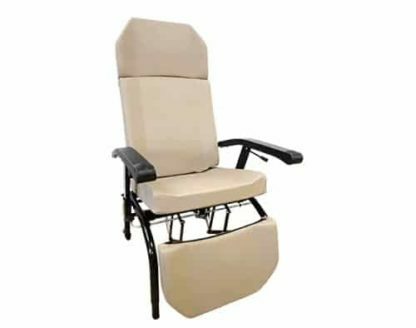 Hire a Height Adjustable Reclining High Back Chair from us for as long as you require giving you the peace of mind that this is going to fulfil your needs. If after you have tried the care chair you would like to purchase one then we will allow you up to 1 weeks of the hire discounted against the purchase. Plus if you wish to purchase the care chair we have delivered to you on hire then you will also benefit from a further 10% fleet discount off of the retail price. A height adjustable, reclining back high seat chair with adjustable and retractable armrests to enhance everyday comfort and offer support. Whether you are wanting something to use in a residential or care environment then this height adjustable, reclining back high seat chair is a perfect addition to enhance your everyday comfort. This chair features height adjustable legs so you can change the height of the seat to suit, plus it has height adjustable and retractable armrests to aid your comfort and support. Comfort and support are added to, with this rest chair, thanks to its reclining back, adjustable footrest and independent removable headrest. With a reclining backrest and an adjustable footrest this high seat chair allows you the flexibility to find a position that is suitable for you. It also offers you extra support you might need with its independent and removable headrest. The comfort of this chair is added to thanks to the seamless M1 fire resistant upholstery which is made from high resilience foam. This chair is a durable option for those requiring a seating solution whether it be for lighter everyday use or more intensive use in a home or care environment.